Free Shipping Included! 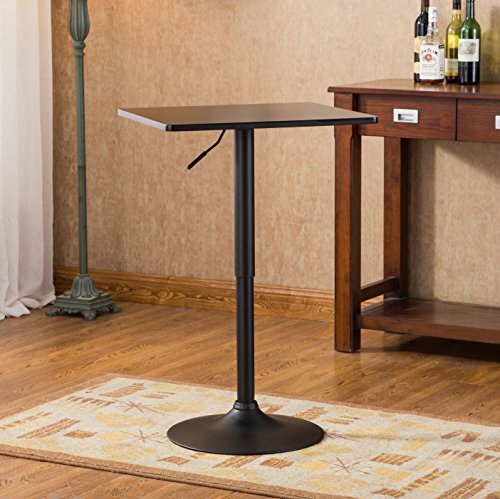 Roundhill Furniture Belham Square Top Adjustable Height with Black Leg and Base Metal Bar Table by Roundhill Furniture at RVTE. MPN: PT252. Hurry! Limited time offer. Offer valid only while supplies last. Smart and sleek, the belham black round top adjustable Height with black leg and base metal bar table offers a world of stylish versatility. Smart and sleek, the belham black round top adjustable Height with black leg and base metal bar table offers a world of stylish versatility. Hydraulics allow the table to be Usable as an intimate table for two or a bar table at a party!. Features an adjustable pneumatic, gas-lift mechanism, table Height adjustable from 26"-36"
Table size: 24" dia x 26"-36"h; base: 17.7"